Only a few years ago, Rainey Street in Austin was a rundown residential area on the edge of downtown. With the help of Bridget Dunlap, a determined entrepreneur with a vision, Rainey Street is now a thriving new entertainment district. Crumbling old homes have been transformed into beautiful new bars and restaurants. And then there's the oddball, Container Bar, which is made of out of carefully arranged shipping containers. All in all, the district is highly walkable and ideal for revelers who don't really have a plan. As the district's popularity has increased, high-rise hotels have popped up nearby. During construction, this puts tremendous strain on the available parking. However, all the hotels are required to provide parking to the public, so there should soon be a variety of gleaming new parking garages to choose from nearby. The ongoing construction means that simply walking around can be hazardous, particularly if you've had a few drinks. Keep an eye out for any unexpected obstacles at ground level, and pay close attention to any posted warning signs. Built out of repurposed freight containers, the Container Bar was the first to break the old-houses-turned-bars mold on Rainey Street. The seven containers are stacked to create a second floor of intimate rooms. Each space is fairly small, but the containers surround a huge central courtyard. Explore this bar before you've visited the other ones so that you can fully appreciate how unique it is. In addition to creating a one-of-a-kind experience, the design is an excellent example of adaptive reuse. 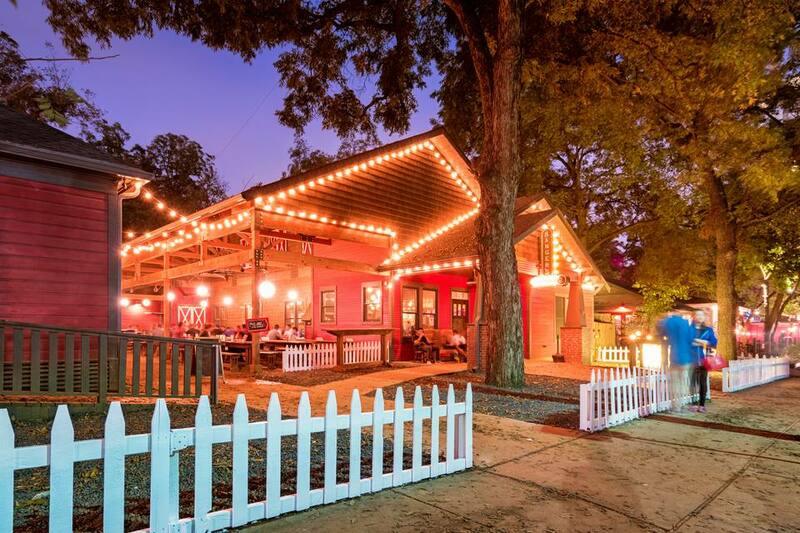 Offering an ever-changing menu of artisanal drinks such as the Peach Smash, Bungalow sets itself apart from the rest of the Rainey Street crowd by offering a medium-energy vibe and laid back bartenders. In summertime, the adult snowcones are a must-have. It also has a sprawling outdoor area with games. Serving only Texas-made beers, Craft Pride is heaven for Lone Star beer nerds. After knocking back a few pints, head to the VIA Pizza truck in the back and enjoy one of the best pizzas in town. It's Detroit-style! At the rear of the bar, the Bottle Shoppe offers many of the craft beers and a few Texas wines to go. As of September 2018, the construction activity around Craft Pride has become slightly less intense. A few construction cranes still hover overhead, and new buildings cast a shadow over many of the nearby bars. As you walk down the street, you often have to navigate around roped-off construction zones. Low lighting and elegant decor make this one of the few Rainey Street bars with a romantic atmosphere. The dangerous little secret at Clive Bar is the tiny mescal bar in the back. It serves several varieties of this tequila-like firewater, but proceed with caution. At the main bar, the specialty is infused spirits. With a design inspired by hill country dance halls, Javelina is a relaxing spot amid the chaos that is Rainey Street. The bar has a nice selection of local beers and a few specialty cocktails, such as the Kimble, made with rum, mango, and jalapeño. The watermelon-based Sandiamo is also a refreshing and boozy treat. However, the food is the main attraction at Javelina. Don't miss the sweet potato fries or the borracho tacos. Looking for a hardy appetizer? Try the Javelina Eggs with chipotle aioli and pork sausage. For something lighter, try the Grilled Watermelon Salad.